Chinese officials say they are on course to achieve GDP growth of about 8% this year, and the fall's dire predictions of massive unemployment leading to social upheaval haven't been borne out. But last week's killing of a steel-company executive by striking workers in northeastern China highlights the ongoing threat of labor unrest even as the country shows signs of emerging from the economic downturn. On Friday, July 24, thousands of workers at the state-owned Tonghua Iron and Steel Group in Jilin province protested the planned takeover of their employer by the privately held Jianlong Steel, according to reports in the Chinese press and from the Hong Kongbased Information Center for Human Rights and Democracy. Some of the steelworkers rioted and beat to death Chen Guojun, a Jianlong representative. Jianlong had previously purchased a stake in Tonghua, and workers feared that with a takeover the company would lay off thousands of Tonghua employees. "Chen disillusioned workers and provoked them by saying most of them would be laid off in three days," said a Tonghua police officer named Wang, according to the state-run China Daily. "Chen, saying that a total number of 30,000 employees would be cut to 5,000, infuriated the crowd." 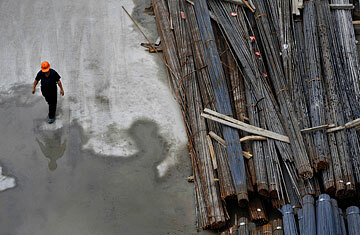 Friday's violence occurred as prospects for China's steel industry are turning around. The government's $586 billion stimulus package has set off a massive infrastructure-building spree, creating a huge demand for steel. In June crude-steel production hit nearly 50 million tons  6% higher than in the previous year, according to the World Steel Association, and close to an all-time high. "Demand has just exploded in the first half of this year as a result of the government's stimulus package and bank lending," says Jim Lennon, a Macquarie Bank analyst. "Steel demand is massive." But that massive demand offers only a temporary respite for Chinese policymakers. Over the past decade, China has rapidly built new steel mills, and in 2002 it became the world's largest producer of the commodity. Now Chinese officials say the country has more production capability than markets at home and abroad can support. In February, Luo Bingsheng, secretary general of the China Iron and Steel Association, said China's steel-production capacity exceeded the 2008 domestic demand of 500 million tons by 160 million tons. China's State Council has called for a consolidation of the industry in order to manage output better, with five major producers generating 45% of Chinese steel by 2011. The government similarly hopes to cut the number of major automakers from 14 to 10 and to consolidate the estimated 5,000 cement producers. Such restructuring should leave China with stronger, more stable industries. But the process will be painful. Workers often find themselves with little say in matters and few chances to negotiate for better severance or retraining, says Geoffrey Crothall, spokesman for the Hong Kongbased China Labour Bulletin, a workers'-rights NGO. "Downsizing and consolidation in and of itself is not the problem. It's the way in which that process is undertaken," Crothall says. "What has been the case for many years is the privatization and restructuring of state-owned enterprises. The selling-off of state-owned assets and merger of state-owned companies has nearly always been done behind closed doors. The workers are never involved they are simply presented with an ultimatum." Employees are angry not just because of their lack of input, Crothall says, but often also because the process is tainted by corruption. "Workers have no idea about the true value of the assets that are being privatized," he says. "Very often they accuse management  correctly in many cases  of embezzling assets in league with corrupt officials." In the case of Tonghua Iron and Steel, it seems the steel industry's turnaround helped spark the riot. Jianlong had invested in the company in 2005 but then pulled out as Tonghua lost money amid the global downturn this spring. But as China's steel demand surged, Tonghua turned a profit of $6 million last month, renewing Jianlong's interest. After the killing of Jianlong's representative on Friday, the local government announced the deal was canceled, China Daily reported.